Standing on a steep hill overlooking the waters of Van Lake, Van Fortress is the sight to remember. 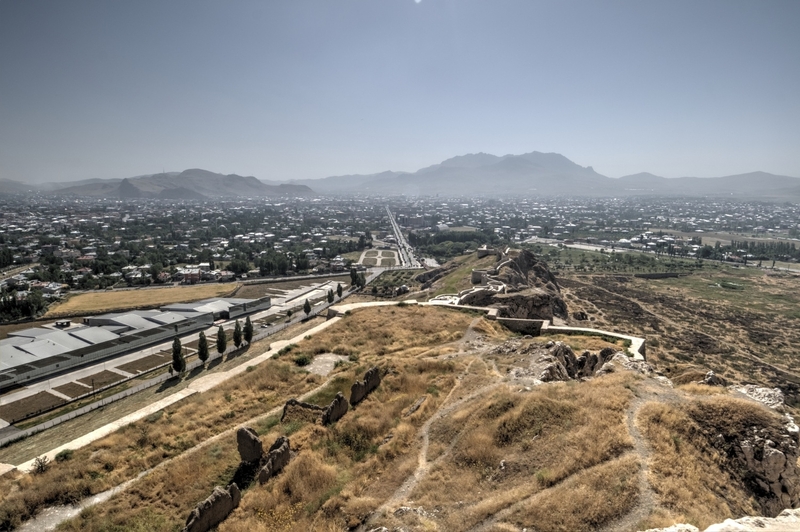 It used to be the seat of the Urartian kings that ruled over the region in the beginnings of the first millennium BCE. 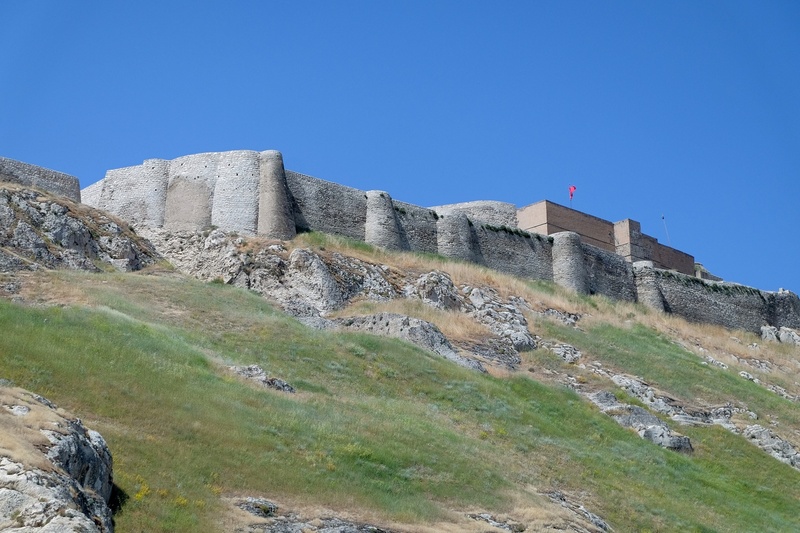 Antonio Sagona and Paul Zimansky called their state "the kingdom of fortresses", and Van Fortress is the most impressive of these structures. The area of Van Lake is the most fertile territory of the region, and as such it has attracted numerous settlers over the millennia. The oldest traces of human activity near Van were found at Tilkitepe mound, one of the first excavated mounds in Turkey. 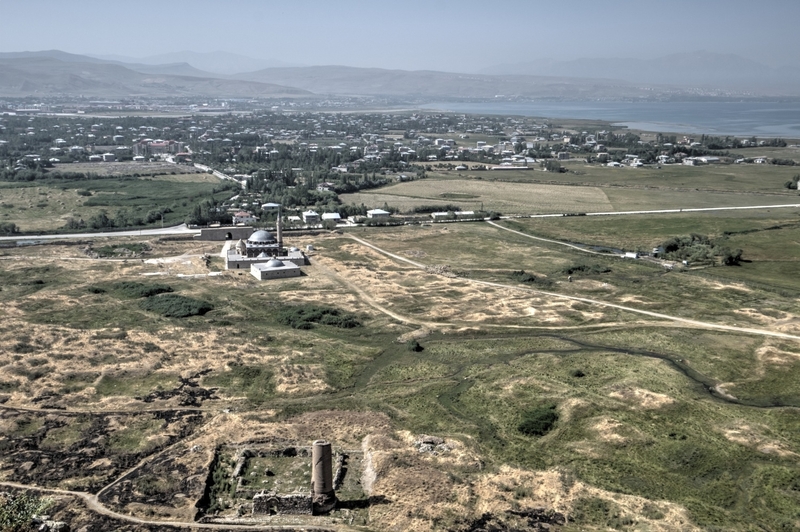 The site, located along the shores of Lake Van and a few kilometres to the south of the citadel of Van, is the only known source of information about the oldest cultures of Van predating the founding of Tushpa, the 9th-century BCE capital of Urartu. The site was excavated in three campaigns, in 1899, 1937, and 1939. The excavation finds of Tilkitepe played a leading role in the archaeology of the Eastern Anatolia for years. Level I starts at the end of the fourth millennium BCE and continues in the third millennium BCE while level O is the transition period from the third to the second millennium BCE. Other Bronze Age rural settlements discovered nearby are called Dilkaya and Karagündüz. The beginnings of the Iron Age in Anatolia coincided with the rapid development of the Kingdom of Bianili in the eastern part of the region. This political entity emerged in the second half of the 9th century BCE in the area around Lake Van. This location had been known as Urartu, and the kingdom was also called Urartu by other peoples of the era, including the Assyrians. The kings of Urartu ruled from Tushpa, the capital situated on the eastern shore of Lake Van. The earliest mention of Tushpa is in the context of the war between the Urartians and the Assyrians. The defeat of the Urartian king Sarduri I by Shalmaneser III of Assyria was commemorated by the inscriptions on the Balawat Gates from Kalhu, the Assyrian capital city. The remains of two sets of gates can now be seen in the British Museum's collection and the Mosul Museum. Small sections of the Shalmaneser bronze door bands are also at the Walters Art Museum in Baltimore and the Istanbul Archaeology Museums. Despite the initial setbacks caused by the conflict with Assyria, quick territorial acquisitions allowed the Urartians to control vast lands of what is now eastern Turkey, northwest Iran, and Armenia. King Sarduri I is mentioned as the builder of a wall in an inscription on a small fortification west of the citadel of Tushpa. Therefore, it is also frequently accepted that he was, in fact, the founder of the city which is now known as Van. The inscription, written in Assyrian cuneiform, is called the Annals of Sarduri. It states that "This is the inscription of king Sarduri, son of the great king Lutipri, the powerful king who does not fear to fight, the amazing shepherd, the king who ruled the rebels. I am Sarduri, son of Lutipri, the king of kings and the king who received the tribute of all the kings. Sarduri, son of Lutipri, says: I brought these stone blocks from the city of Alniunu. I built this wall." It is also the oldest known Urartian inscription discovered so far. King Menua, the grandson of Sarduri, greatly expanded the kingdom and organised the centralised administrative structure. He is also known as the builder of a canal and irrigation system that stretched across the country. Interestingly, several of these canals are still used nowadays. 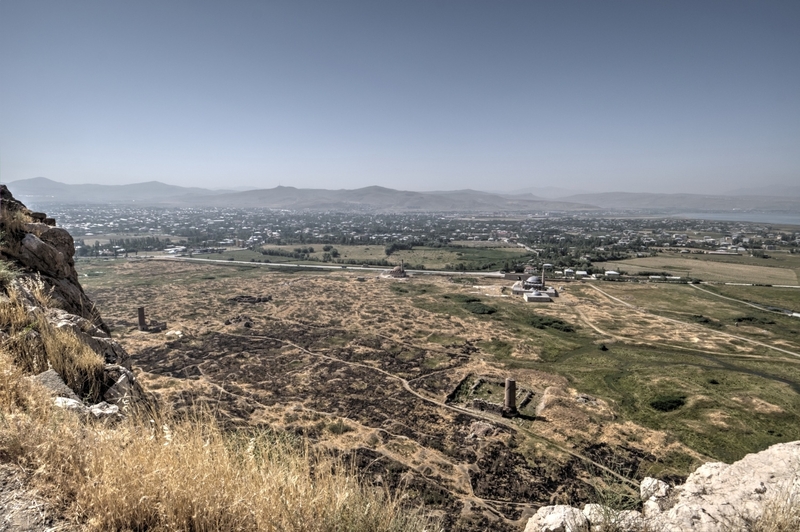 The most spectacular example of King Menua's irrigation system is Semiramis/Şamran canal that brought fresh water to the capital city of Tushpa, its gardens and fields, from the valley of the Hoşap River south-east of Van. Large stretches of this canal are still visible, along with the inscription stating that: "By the will of Khaldi, Menua, son of Ishpuini, has built this canal. This canal is named Menua Canal. Menua the powerful, the great king, King of Biaina, Prince of the city of Tushpa; Menua speaks in the name of the dread Khaldi: Whosoever damages this inscription, whosoever overturns it, whosoever does such things according to his own desire or in the name of another, Menua warns that the dread god Khaldi, the god Teisheba and the Sun god Sivini will efface him from the sign of the sun." Further written evidence of Urartian history was provided by other inscriptions found in the area of Van Fortress. One of these inscriptions is known as the Annals of Argisti I. 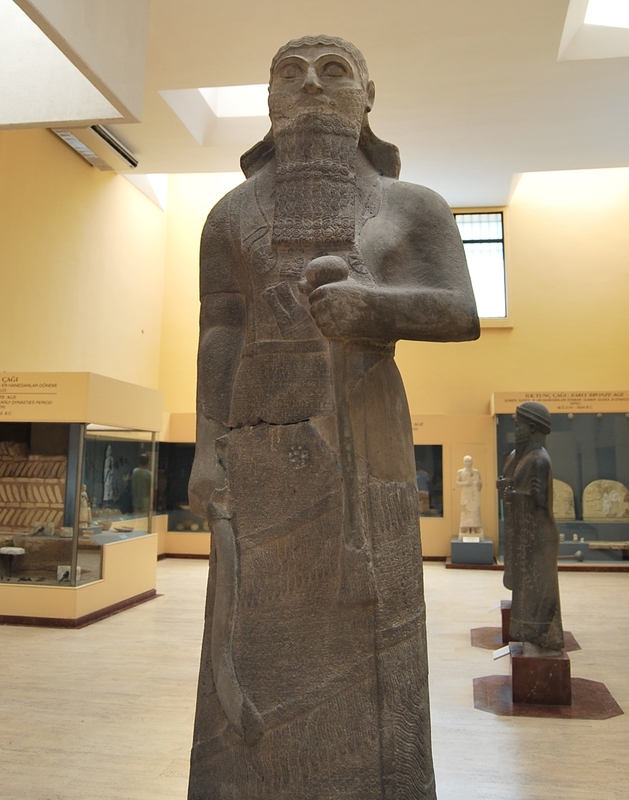 This king, who ruled Urartu from 785 to 763 BCE, fortified the empire's frontier and is most remembered as the founder of Erebuni (modern-day Yerevan). His annals can be found on the face of the cliff of the Van citadel, above the stairs leading to his tomb. The rule of his son, Sarduri II, from 763 to 735 BCE, marks the zenith of Urartian power. He also left the inscription in the area of Van citadel. The Annals of Sarduri II present him as a very successful king, despite the defeat he suffered from the Assyrian king, Tiglath-Pileser II. The inscription is on a stele, within a large rock niche, on the north side of the Van citadel rock. This location is known as Hazine Kapisi. There are two niches there, and the inscription is located in the bigger of them. Soon afterwards, the Urartu Kingdom went into the period of decline. During the reign of Rusa I, from 735 to 714 BCE Assyrians and Cimmerians attack the kingdom. King Rusa I was crushingly defeated by Sargon II at Lake Urmia and subsequently committed suicide in shame. In the 7th century, Urartu Kingdom grew weaker and weaker, suffering the continuous attacks of Cimmerians and Scythians. In this period it became dependent on Assyria. Rusa II, son of Argishti II, who ruled from 680 to 639 BCE, was the last Urartian king who carried out significant construction projects. During his reign the massive fortress complex of Karmir-Blur, near the modern city of Yerevan in Armenia, was constructed. The circumstances and main actors of the final decades of Bianili/Urartu are unclear, but archaeological evidence suggests that the kingdom met a violent end. All the citadels erected by Rusa II were destroyed. The effective end of Urartu's sovereignty came in 585 BCE when the Medes took over the Urartian capital of Van. The region of Urartu became the Satrapy of Armenia under the Achaemenids. In this period, the Van citadel was abandoned, but the name Tushpa was remembered as it was transformed into Thospitis and used to describe the lake, later known as Van. 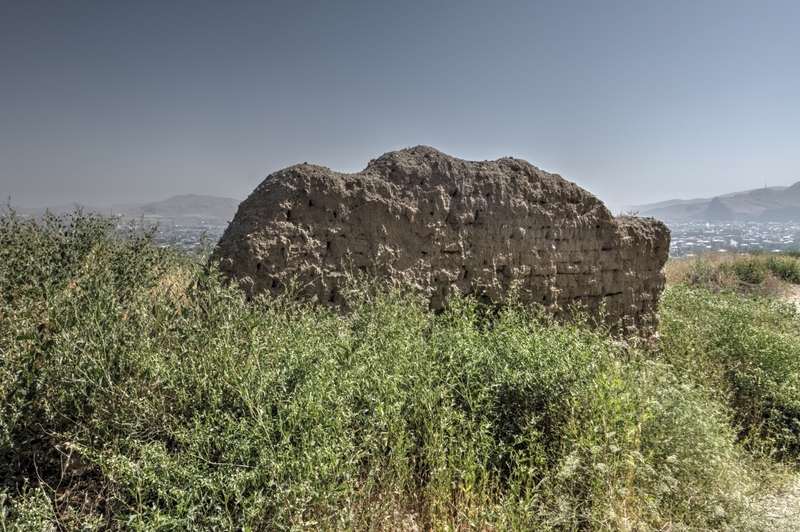 The Achaemenid rule over Van is now remembered because of the inscription left on the southern face of the citadel by King Xerxes. The history behind this inscription is peculiar. The place for it had been prepared by King Darius, the father of Xerxes, but he never got round to inscribing it. Thus, Xerxes intended to fill in the void by informing the readers that his father did not make an inscription: "King Xerxes says: King Darius, my father, by the grace of Ahuramazda built much that was good, and he gave orders to dig this niche out, but because he did not make an inscription, I ordered this inscription to be made." Actually, the inscription is much longer, and it consists of three columns of 27 lines written in Old Persian, Babylonian, and Elamite. It has been preserved in almost perfect condition, and it is the only Achaemenid royal inscription that can be seen outside Iran. The trilingual inscription of Xerxes significantly contributed to the decipherment of Old Persian cuneiform by Eugène Burnouf in the mid-nineteenth century. 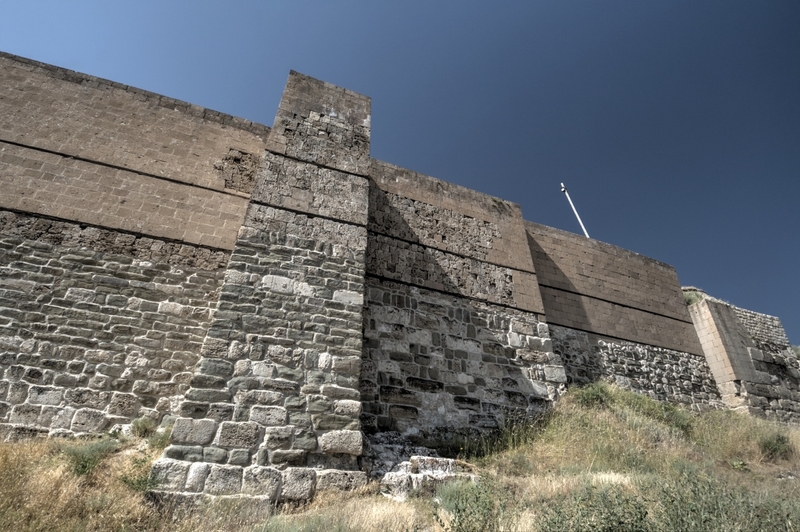 The inscription is situated on the southern face of Van citadel, some 20 meters above the ground. In time, the town developed to the south of the citadel, and it continued its existence until the First World War. Successive states that ruled the area were the Achaemenids, Armenians, Parthians, Romans, Sassanid Persians, Byzantines, Arabs, Seljuks, Safavids, Afsharids, Ottomans, and Russians. 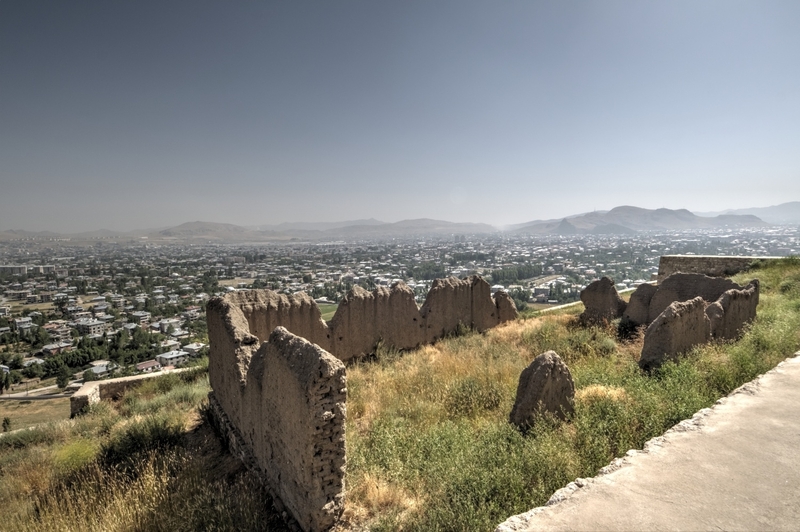 Therefore, the ancient ruins of the Urartian fortress now support the walls constructed during the medieval era and the Ottoman rule. 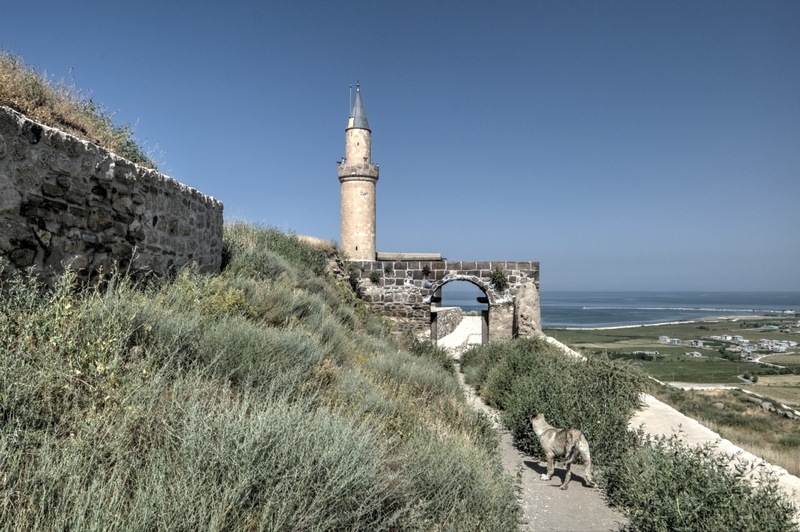 In the modern era, an interest in the ancient history of Lake Van area was sparked by the writings of Movses Khorenatsi, a prominent Armenian historian from the period of Late Antiquity. His chief work - History of Armenia - includes unique material on the old oral traditions before Armenia's conversion to Christianity and traces the history of the country to its ancient origins. 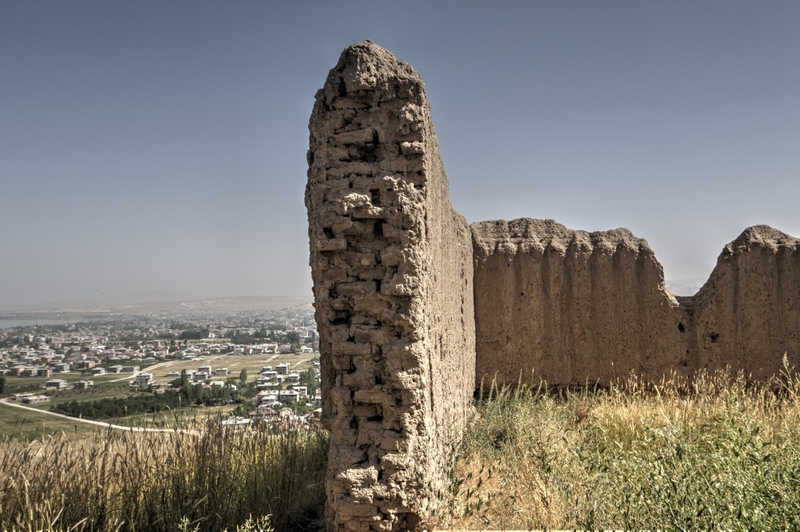 Khorenatsi discussed the Urartian fortress in Van but attributed its construction to the legendary figures of Ara the Beautiful and Queen Semiramis. Ara the Beautiful was a legendary Armenian hero who was so handsome that the Assyrian queen Semiramis wanted to marry him. Rejected, the queen waged war against Armenia, to get Ara alive but he was killed in battle along with one of the queen's sons. This legend describes the construction of a new town "east of the Salt Lake" and "south of the Ararat Valley". Carl Ritter, the founder of scientific geography, suspected that the ruins of this city could be found east of Lake Van. Inspired by the legend, the French scholar Jean Saint-Martin suggested organising an expedition to the Van area, on behalf of the French Oriental Society. The person who led this expedition was Friedrich Eduard Schulz, a German orientalist. He discovered and copied many cuneiform inscriptions, written partly in Assyrian, and partly in a hitherto unknown language. The first account of his discoveries was first published in 1828 by Saint-Martin in Nouveau Journal Asiatique. Schulz remained in the region to conduct more detailed research, but he met an untimely end in 1829 when he was murdered in Başkale by the clan chief Nur Ullah Bey. The reason for this outrageous deed was that his talks with the villagers and taking notes made him look like an Ottoman spy. His notes from the expedition were later recovered and published in 1836 in Paris. Charles Texier, the discoverer of the ancient Hittite capital of Hattusa, visited Van in 1838. In the late 1840s, Austen Henry Layard led an expedition to the Near East. Although he is best known as the excavator of Nimrud and Nineveh, he also copied numerous inscriptions discovered in the area of Van Fortress, including the writings of Argisti chamber. In 1890-1891, the German engineer Karl Sester, who had discovered the monuments on Mount Nemrut, worked in Van. There, he collected cuneiform inscriptions, which, however, did not stir any interest among the Deutsche Orient-Gesellschaft. In his letters, he constantly complained about the inadequate work of the English archaeological team on Toprakkale site. All of the Urartian inscriptions discovered in the 19th century were written in neo-Assyrian cuneiform. However, after this language had been deciphered, it became apparent that Urartian language is entirely different and unlike any other known language. In 1882, Archibald Henry Sayce published the first comprehensive collection of Urartian inscriptions, but he assumed, erroneously, that they were of Hurrian origins. Other attempts at reading the script, based on the comparative methods with the application of modern languages such as Georgian and Armenian, also failed. Only after the discovery of bilingual inscriptions of Kelišin and Topzawa the progress in reading the Urartian was made. Finally, the vocabulary and grammar of Urartian language were discovered and published by Albrecht Götze and Johannes Friedrich in the 30-ties of the 20th century. During the First World War, Lake Van region briefly fell under Russian control. 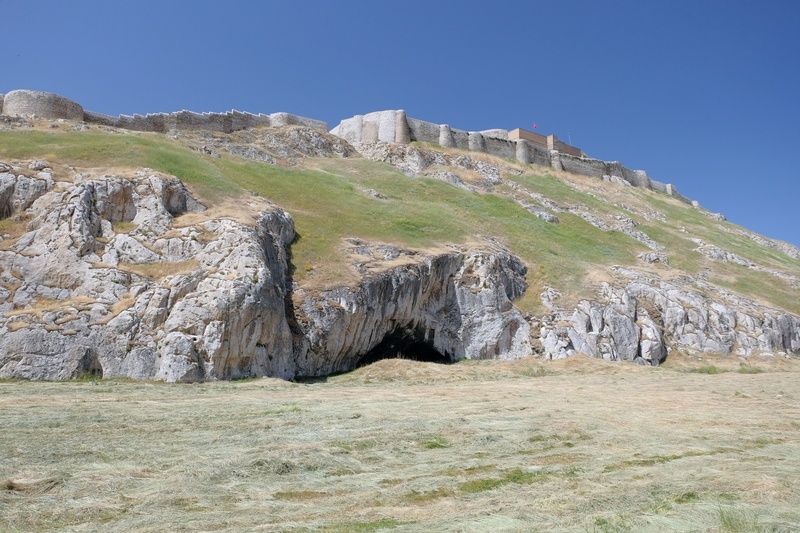 In 1916, the Russian scientists, Nikolay Yakovlevich Marr and Iosif Abgarovich Orbeli started first regular excavations of Van Fortress. Their main contribution was the discovery of a four-faced stele carrying the annals of Sarduri II. In 1938, American scholars Kirsopp Lake, Silva Tipple New Lake, and Robert P. Casey obtained permission to conduct excavations of Van Fortress, as Brown University and University of Pennsylvania joint expedition. Kirsopp Lake had tried to get there earlier, but he spent 15 years seeking the approval of the Turkish authorities. Before setting out, Kirsopp Lake gave an interview for The Harvard Crimson where he stated that "[until 1937], the savage tribes of Turkish Armenia, the Kurds, have not been sufficiently pacified for the government to recommend the trip". The excavations of the American team, conducted at the mound and in the city of Lower Van, were interrupted by the Second World War. The initial report of the expedition was published in 1939. However, most of their finds and field records were lost when the ship transporting them from Great Britain to Canada - the SS Athenia - was torpedoed by a German submarine. The surviving documents waited for the publication until 1977 when they were prepared by Manfred Korfmann, the famous German archaeologist who devoted his life to the excavations of Troy. Erkan Konyar from Istanbul University admits that "The American team did reach the Urartian levels at a spot now unknown", somewhere in the area of the Lower City of Tushpa. Thus, even in the middle of the 20th century, not much was actually known about Van Fortress and its ancient history. Hans-Volkmar Herrmann, a German archaeologist, lamented the state of Urartian studies in the following words: "[...] this is how the history of the exploration of the old centre on Lake Van presents itself as a chain of failed or short-lived undertakings, begun, broken off and above all never really published." The situation started to improve in 1956 when Charles A. Burney, a British archaeologist, began field inspections in the Van area. He identified and made sketches of numerous Urartian sites during field expeditions to the Lake Van region. His discoveries of Urartian fortifications and irrigation systems triggered further research in the eastern provinces of Turkey. Istanbul University initiated archaeological works in Van in 1959. The team, led by Afif Erzen, first dug in Toprakkale, and then in the area of Van Mound, in 1963. The researchers reported that the soundings conducted in this area detected Early Bronze and Urartian layers. The work was unexpectedly halted due to political problems in the region, and the team only returned to the Van Fortress area in 1972-1975. Another round of excavations at the Lower City of Van Fortress was conducted from 1987 to 1991. This time, the team was led by Taner Tarhan from Istanbul University. The excavations, performed at the westernmost tip of the mound, revealed a building with 15 rooms. This residential complex, with stone foundations and mudbrick walls, was called the Early Architectural Phase. It was erected on the top of a conflagration layer, and the scholars dated it to the 8th century BCE. The Late Architectural Phase, severely damaged by the later burials, was dated to the 7th century BCE. According to professor Tarhan, the Lower City of Tushpa was first founded in the south of the citadel. In this location, the inhabitants were protected by the fortress hill from the harsh northern winter winds. After the 9th century BCE, the settlement expanded and formed new districts around the citadel. The latest excavations of Van Castle, Tushpa Lower City, and Van Mound started in 2010, also under the patronage of Istanbul University. 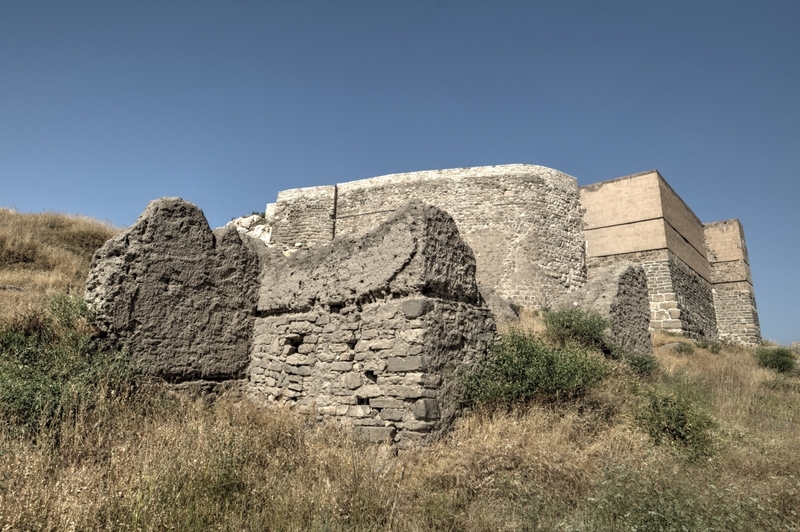 The team has been led by Erkan Konyar, and the primary goal of the work is to obtain archaeological finds concerning the strata of pre-Urartu and Urartu periods. The scholars hope that their findings will help to redefine the second millennium period of the region's history and to understand the transition to the Iron Age. 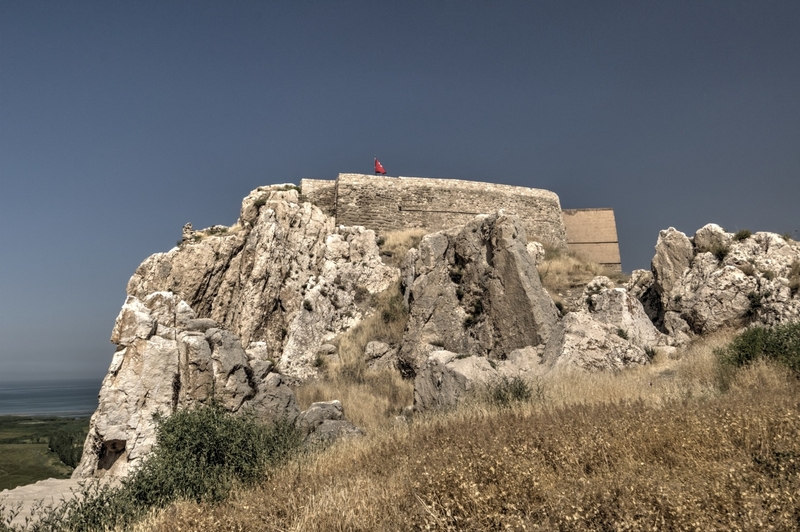 The fortress of Tushpa is a massive fortification that still makes a tremendous impression on the visitors as it is one of the largest castles in Anatolia. It was erected on the steep-sided bluff from two main kinds of construction materials. Its lower walls were built of unmortared basalt and the upper sections of the walls - from mud-bricks. 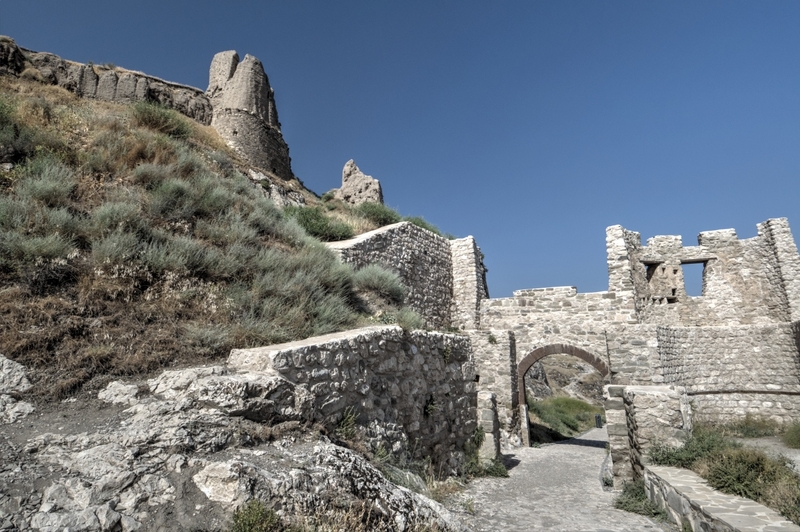 The fortress rises on a 100-meter high rocky outcrop, nearby the eastern shore of Van Lake. This geological formation stretches along the west-east axis. It is 1250 meters long and has a varying width of 70 to 80 meters. Its southern side is an almost vertical face, while the northern slope is more gradual but still quite steep. Famous Ottoman traveller, Evliya Çelebi, compared the gigantic rock of Van Fortress to a kneeling camel. To the north of the outcrop lies the mound of Van. It is 750 meters long and is parallel to the citadel. This area forms the northern part of the lower settlement, revealing five thousand years old history of settlement. Below the fortress, to the south, lies another part of the Lower City of Tushpa, revealing eight hundred years of urban fabric. Nowadays, this area, called the Old City of Van, is a depressing desolation. It was destroyed during the First World War as the aftermath of the bloody conflict between the Turks and the Armenians. Together, the northern and the southern areas constituted the lower settlement of Tushpa. 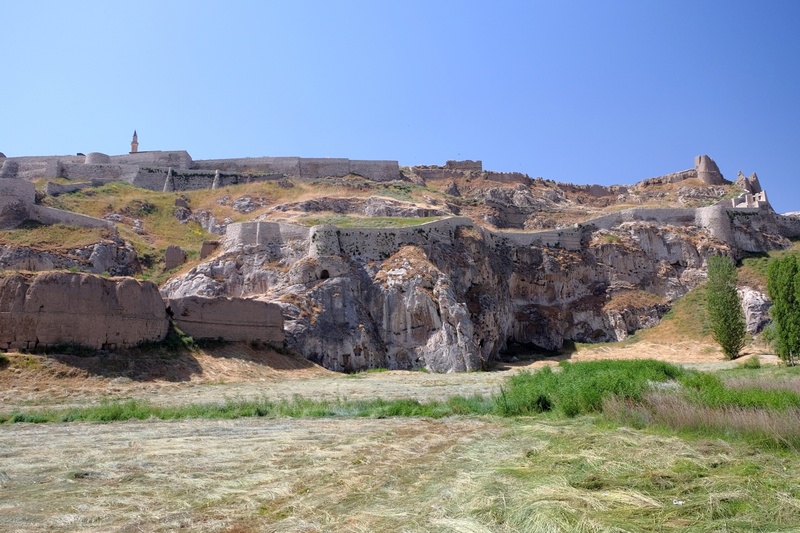 The castle of Van, sitting on a natural fortress, was also protected by two deep trenches, cut into the rock of the ridge. 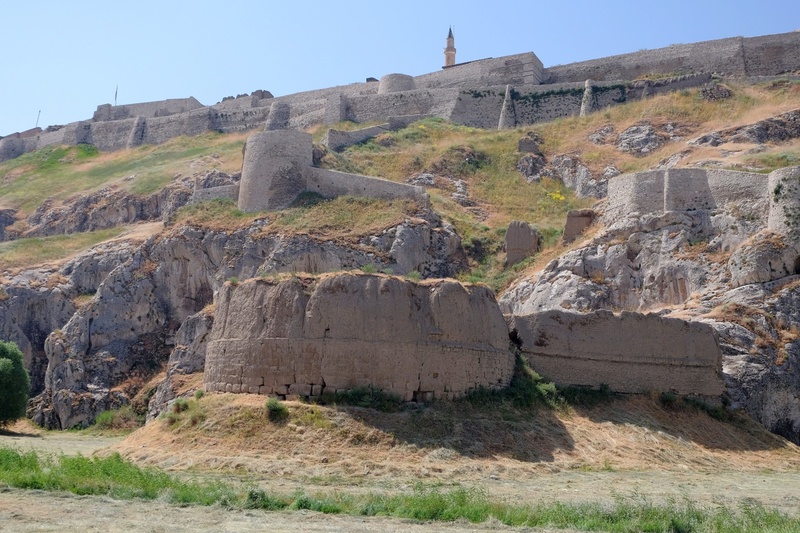 The imposing walls of the citadel were built on stepped rock terraces, characteristic to Urartian architecture. Urartian builders preferred to erect the foundations directly on the bedrock, as thus they created these stepped structures. They also levelled the ground and formed flat surfaces at various parts of the citadel where the buildings with many functions must have stood. The large blocks of the lower courses date back to the times of Urartu, but mud-brick and stone upper courses were added later, in the Ottoman times. The architecture of the citadel was not limited to these fortifications but also included many other buildings and structures, such as rock burial chambers for the kings, open-air sanctuaries, inscriptions on the rocks and inscribed stelae. Unfortunately, little has been preserved of the actual buildings that the Urartians constructed within the walls. The oldest building of the citadel is presumably the so-called Sardur Tower (Sardurburç), situated on the western tip of the ridge. It is the location of the Sarduri I inscription in Neo-Assyrian cuneiform, where this king is declared as the founder of the capital city of Tushpa. As Taner Tarhan comments: "A total of 101 inscriptions found in and around Tushpa demonstrate the importance of the capital, but inscriptions related to royal buildings such as the Sardursburg [i.e. Sardur Tower] are few in number". The tower's foundations measure 47 to 13 meters, and their current height is just 4 meters. The limestone blocks, used to erect the building, weigh up to 10 tons each. Beneath the structure there is an abundant spring. The remains of the tower along with the Urartian jetty are hidden by the copse of willow trees and thus difficult to spot. 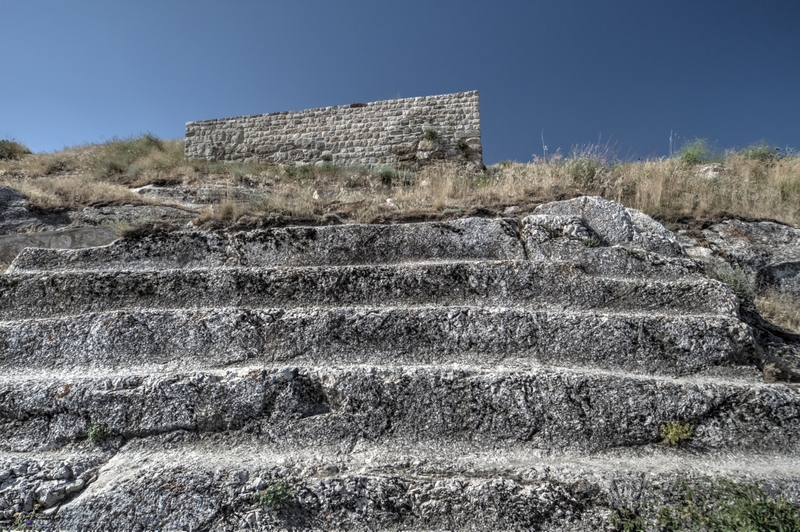 The 10-meter-high walls protect the Inner Fortress, erected on the highest place of the ridge. The entrance to its interior is from the western side. This area is called the Old Palace as the researchers point out the parallels of its architecture and the use of carefully worked calcareous blocks to the appearance of the Sardur Tower. The New Palace area of the fortress bears traces of impressive architecture, and the scholars even suggest that there were three-storied buildings there. There are platforms for warehouses and service rooms as well as the traces of drainage system. It is difficult to imagine the appearance of the buildings that once stood there, but possible reconstructions can be made on the basis of some archaeological discoveries. One of them is a bronze model of an Urartian fortress, found in the area of Toprakkale. In the final years of the Urartian Kingdom, after the Assyrians had destroyed Tushpa Fortress in 714 BCE, Rusa II built another fortress, on the hill now known as Toprakkale, situated just 6 km to the north-east of Tushpa. 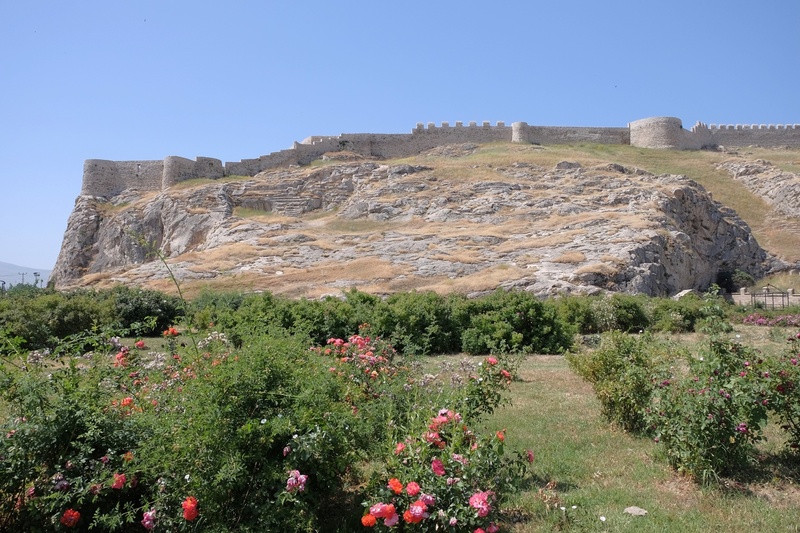 In the king's honour, the new fort was called Rusahinili. Its remains were first excavated at the end of the 19th century by the British archaeologists who took many of precious finds to the British Museum. Among these objects, there is an excellent miniature model, showing the appearance of Urartian fortifications. The model is just 28 cm high and 36 cm wide, but it is remarkably meticulous. The architectural details on the model provide information about Urartian fortifications. The model, whose function is unknown, shows a double-winged gate, rectangular windows, stepped battlements, and a high tower. The lower parts of the walls and the window frames were built of beautifully cut and fitted stone blocks. The upper portions of the wall were made of mud-bricks while the parapets rested on jutting wooden beams. Another hint at the outlook of Urartian architecture has been provided by a stone relief found in Urartian Kef Fortress, near Adilcevaz, on the northern shore of Lake Van. 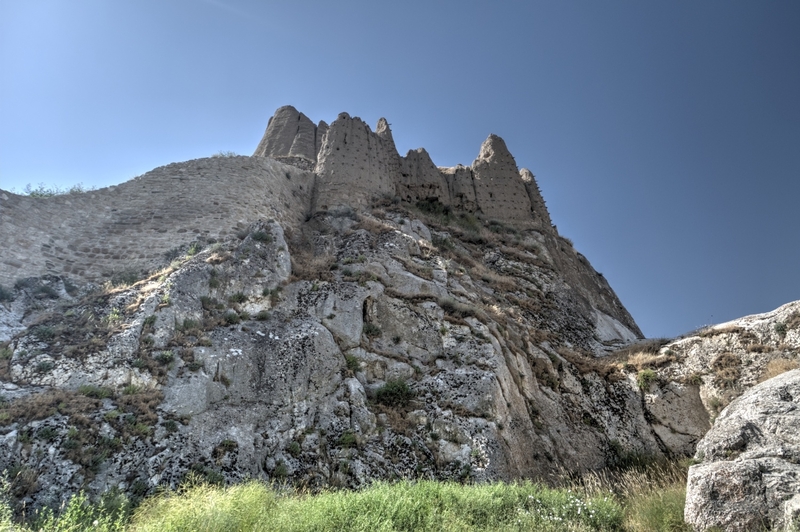 It bears an inscription of King Rusa, and it shows that the walls of Urartian castles were topped by crenellations and towers projecting above. 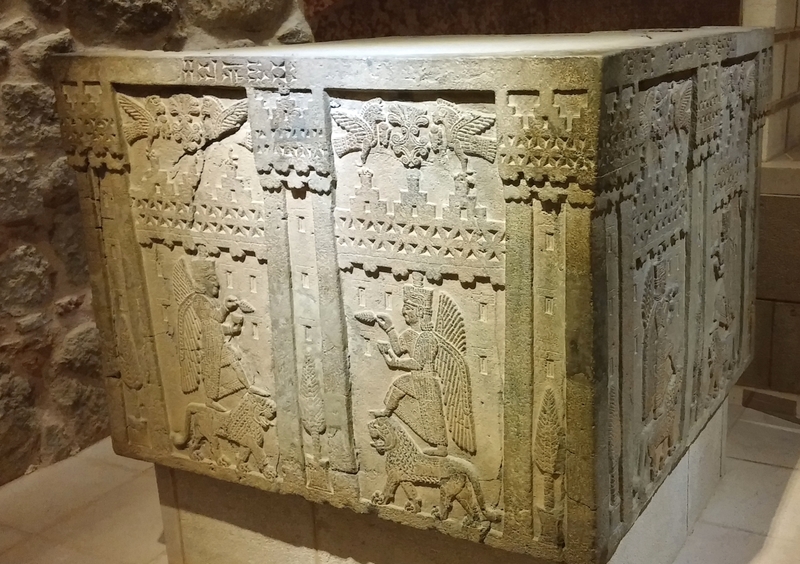 This relief can now be seen in the Museum of Anatolian Civilizations in Ankara. The southern face of Van Fortress hill houses eight tombs cut into the rock. Four of them are multichambered tombs dated to the Urartian period. The first traveller who provided the detailed description of these tombs was Evliya Çelebi in 1655. The largest of the tombs belongs to King Argisti I. Outside, the inscription known as the Annals of Argisti can be seen. In two cases, the tombs can be accessed by long staircases cut in the rock. The multi-chambered tombs have a platform in front of the entrance, a central hall, accessed by the steps, and several adjoining rooms. The rooms reach up to 9 meters in height and cover the area of two hundred square meters. A rock terrace, situated on the northern slope of the hill, is known locally as Mother with Daughter (Analı Kız), because of two niches that it accommodates. It was built by King Sarduri II, and most probably served as a sacred area. The researchers have identified a sizeable grooved channel running down the slope from the platform situated in front of these niches. It presumably carried away the blood of sacrifices performed there. The niches are over 5 meters high and have rounded tops. The Annals of Sarduri II can also be seen there, carved onto a basalt stele. Another rock chamber, also on the northern side of the hill, is called Menua's Stable because it bears an inscription of King Menua at the entrance. Recently, it was used by the locals as a cowshed. Over the centuries, many elements were added to the fortress, and it was repaired and reconstructed several times. Süleyman Han Mosque, the first Islamic structure of the city, still dominates the area, sitting on one of the highest points of the hill. 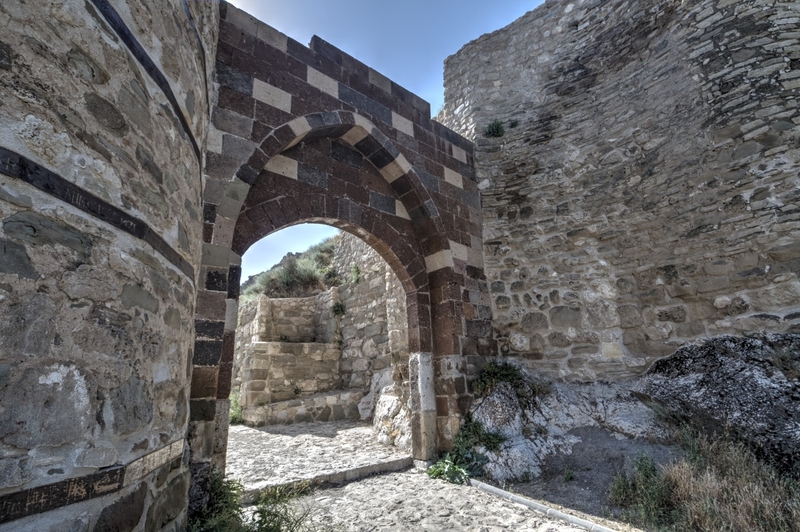 To the south of the fortress lies the ruined Old City of Van. It was surrounded by the walls from the west, south, and east, and three gates led into the city: Tebriz Gate on the east, Middle Gate on the south, and Harbour Gate on the west. 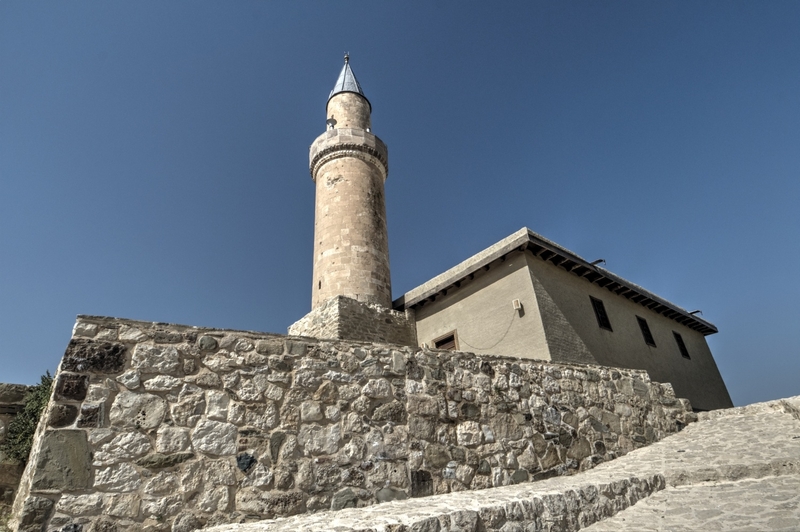 The town was inhabited from the 13th to the early 20th century, mainly by Armenians, but was abandoned after the tragedies of First World War due to massacres of its inhabitants, great demolitions, and fires. The city consisted of streets with single and two-storied houses, churches, mosques, and other buildings. Nowadays, Old Van City is an archaeological site and an open-air museum with important structures such as Surp Paulos and Petros Church (Çifte Kilise), Surp Vardan Church, Surp Stephanos Church, Surp Dsirvanarov Chapel, Red Mosque, Grand Mosque, Hüsrev Pasha Complex, Double Hammam, Kaya Çelebi Mosque, Horhor Mosque, and water cisterns. 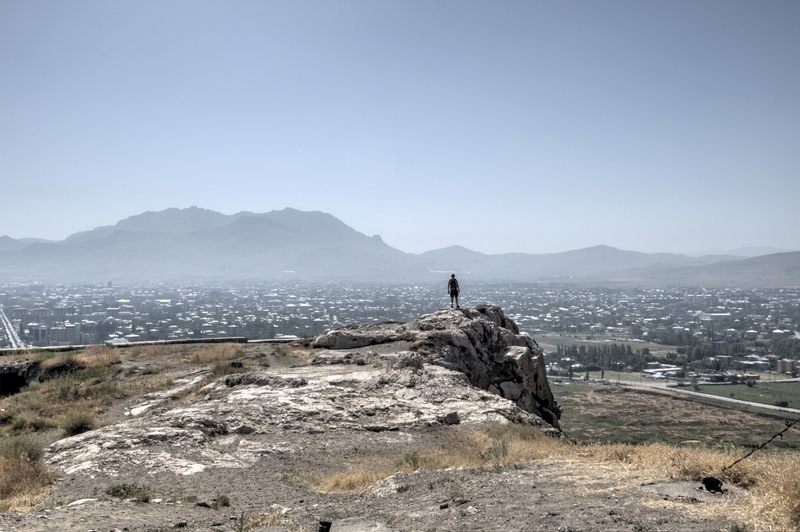 To the north of the Van Fortress, lies Van Mound, where intensive archaeological studies have been conducted recently. It is a valuable asset as there are only a few settlements that can offer a complete picture of the cultural history of the region. The excavations revealed Urartian domestic architecture: multi-roomed houses, stone-paved courts, and stables. The buildings were erected of mudbricks on stone foundations, and they have been preserved up to the height of 1.5 meters. Van Castle is open to visitors every day, in the summer season from 9 am to 7 pm, and in the winter season from 8 am to 5 pm. The entry is free of charge. The best time to visit the castle is late afternoon and early evening, as one can enjoy the sunset over Van Lake from the hill. 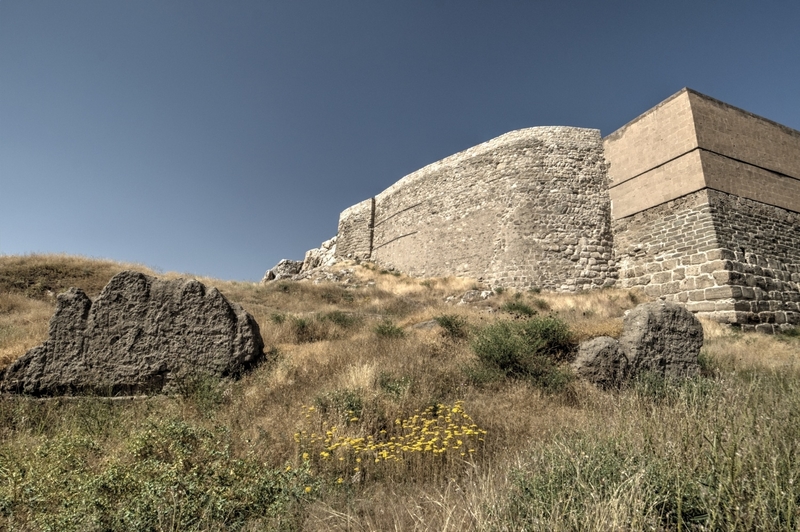 In 2018, the new Urartu Museum, opposite the fortress, was announced to be open soon. The fortress is situated to the west of the centre of modern Van. 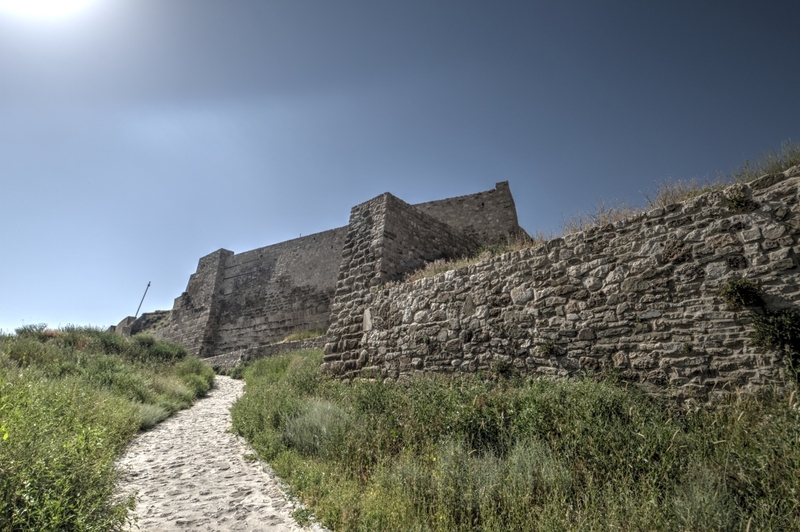 Walk or drive along Melen and Sümbül streets to get to the entrance to the site, on the westernmost point of the fortress. There is a "Kale" minibus from the centre of the city of Van to the castle. It stops on İskele Street, near Hazreti Ömer Mosque. Die Ausgrabungen von Kirsopp und Silva Lake in den Jahren 1938 und 1939 am Bergfelsen von Van (Tušpa) und in Kalecik: Der Verlauf der Arbeiten an Hand von Briefen, Photographien und einem Plan.